Curious Orange: Gull Gets Dyed After Diving Into Vat Of Tikka Masala : The Two-Way A sea gull got the day-glo treatment after it fell into a vat of spicy chicken at a factory in Wales. 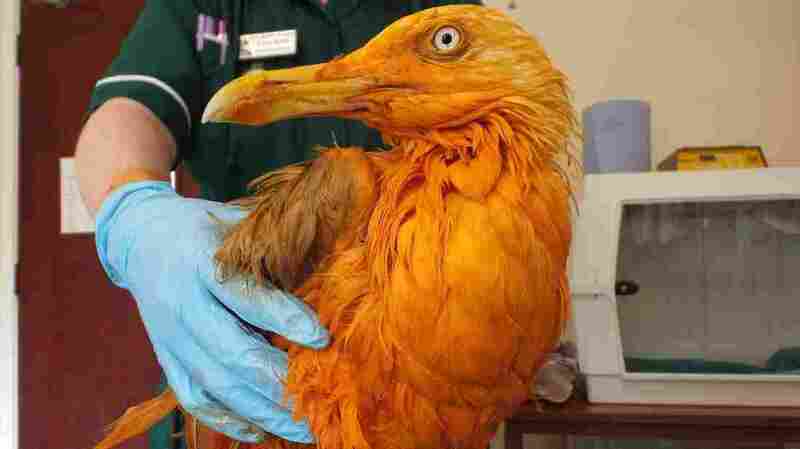 A sea gull got a day-glo makeover when it fell into a vat of chicken tikka masala in Wales. The bird was taken to a wildlife hospital that says it will be fine. That's the description given by Lucy Kells, a veterinary nurse at the Vale Wildlife Hospital near Tewkesbury, who chronicled the bird's recovery on Facebook. Speaking to Wales Online — the bird was found "at an undisclosed curry factory in Wales," the site says, before being brought to the animal hospital — Kells says the bright-orange gull sparked a range of strong feelings, from sympathy and concern to hunger pangs. The consensus about how this day-glo gull came to be, Kells says, is that he was picking out pieces of chicken and fell into a vat — which was outside and, for some reason, had been left uncovered. "He would normally have been able to take off from water but the curry was too thick and gloopy," she says. Luckily for all involved, the bird hadn't been soaking in the sauce for long before he was rescued. But while the Vale hospital says the cleanup was fairly easy, the gull will have to remain a captive for long enough to allow his feathers to regain the natural oils they lost in the cleaning process. When we asked for an update on the gull, Vale founder Caroline Gould wrote back to say, "the gull will be released once his feathers are waterproof." She added that the bird is now back to his normal color and should be fine when he's released. Chicken tikka masala is a wildly popular dish in Britain. We'll remind you that former Foreign Secretary Robin Cook once dubbed it "a true British national dish" — and that was back in 2001. Since then, there's been no indication that the Brits have gone off the (delightfully spicy) sauce. In all, the folks at Vale Wildlife seem to have taken this unusual rescue in stride — something we might attribute to the organization's roots in (sauce alert!) Worcestershire. Or perhaps it's due to the more than 4,000 cases the charity now handles each year, according to Gould's figures.